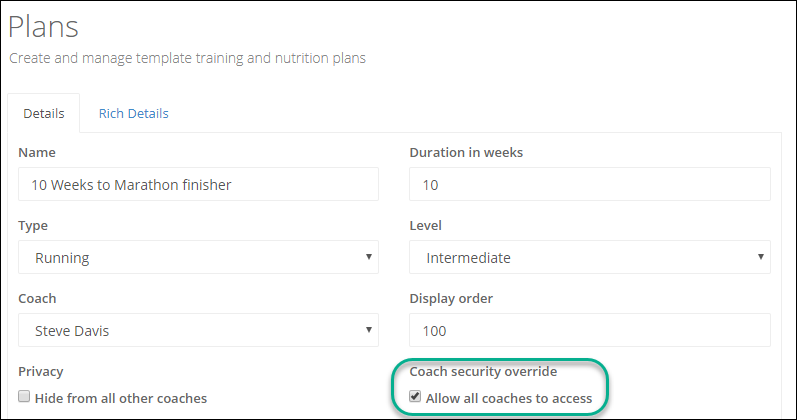 It's now possible to assign different permissions to coaches so you can restrict access to parts of the platform including features, athletes, training plans and workouts. There are three main permissions. These three permissions are all independent of each other and can be configured by editing a coaches account. 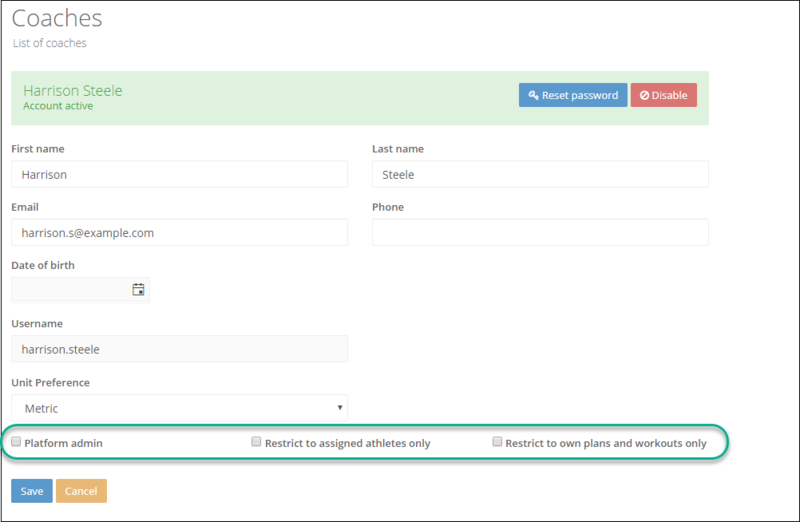 If a coach has platform admin permissions they can access the entire platform including all of the settings. If a coach does NOT have Platform Admin permission then they will NOT be able to access the following features. This permission applies only to features related to athlete accounts and if set against a coach they will only be able to view the athletes that are assigned to them. They will not be able to view other athlete details or calendars. The also won't be able to use the messaging feature to message any athletes other than those assigned to them. You can assign a coach to an athlete by editing the athlete account. This permission applies only to template plans and workouts and does not apply to athlete plans and athlete workouts. If this is selected for a coach then they will only be able to view and edit training plans and workouts that they create or that are assigned to them. You can assign a plan or a work out to a coach. You can make exceptions to the "Restrict to Own Plans and Workouts Only" rule by overriding it and editing the plan or workout you want to allow access to. If you check the "Allow all coaches to access" box when editing a plan or a workout. This will mean any coach regardless of their permissions will have access. Additionally if you want one of your plans to be hidden from all other coaches you can set the privacy to be "hide from all other coaches" so only you can see the plan. Note: setting this flag will automatically assign the plan to your coach account. Note: if both these exceptions are set on a plan then the "Allow all other coaches to access" setting takes precedence.